Bird Fruit Feeder for Orioles, Cardinals, and More! Are You Missing Out On The Most Beautiful Birds Of Summer? Do You Want The Most Colorful Birds Of Summer, Close-Up In Your Backyard? You can with this Eco Friendly Fruit Feeder from Duncraft. 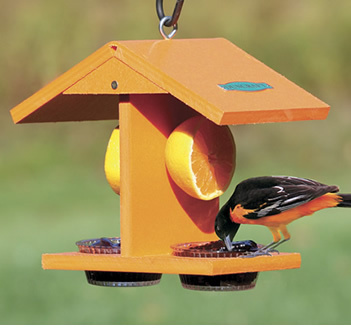 More Than Just An Oriole Feeder, place orange halves on the dowels or place raisins, berries, or grapes in the bowl to attract all the birds that don't normally visit your seed feeders. If you've never offered fruit for the birds before, you've been missing out on some of summers best birding. Orioles, Robins, Woodpeckers, Mockingbirds, Catbirds, Cardinals and More Are attracted to fruit, berries and nuts. Now you can attract and watch these beautiful birds up close in all their splendor. Imagine watching Mockingbirds, Robins, Bluebirds, and Orioles in their brightest colors, visiting close to your window or deck. Made from eco friendly materials that will last a lifetime. You can even wash this Fruit Feeder in your dishwasher. Comes with two bowls for placing berries, pieces of fruit, raisins, grapes or any other kind of fruit or nut. Try adding grape jelly in spring for those hungry orioles and a few mealworms for Bluebirds, Robins and others.. Hang the feeder from a tree branch or off your deck for a close-up look at summers most beautiful birds. When Spring Arrives, This is the one feeder I don't want to be without!